Playmates introduced the Nano Fighters with a nice program at the F.A.O. toy store in New York City. After seeing the press release for the new Nano Fighter Pets I had the following comments. I particularly liked the introduction method, George Foreman is a great individual and a great icon for the fighting world. His association with the launch instead of another "look here comes the Brinks truck" episode was a very refreshing. 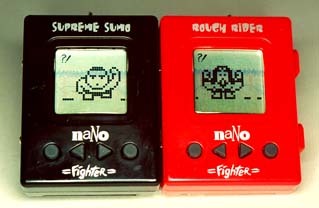 I also like the names of the fighting pets: Rough Rider, Supreme Sumo, and Alley Fighter. I do think the press release was a bit heavy on the "finally give boys a virtual pet they can truly adopt as their own." There are already dozens of virtual pets for boys and even several linking pets for boys. But press releases are for you to "toot" your own horn. We obtained a pair of the pets at a K-BToys in Tulsa Oklahoma on 20 December 1997. The pets were only introduced on the 18th. Usually new pets take much longer to reach our region of the country. We purchased a black Supreme Sumo and a red Rough Rider for $19.99 each. The packaging was bright and pretty. The units were plastic encapsulated on a brightly colored display card with a hanger. The card and the instructions included in small type, "Ages 8 and up!". The instruction sheet included the URL for the Playmates Toys web site. Very small print on the packaging says "Conforms to toy safety standards ASTM F963". The back of the package also showed the basic nano pets and the talking nanos. The basic pets include several units I have not seen: Nano Double (Kitty & Puppy), Nano Bunny, Nano Teddy, Nano Pony, Nano Dino, and Nano Turtle. The packaging DOES NOT point out that the instruction sheet is between the folded over display card. We are encouraging manufacturers to point this out. Many children throw away the card without retrieving the instructions. The instructions were understandable, but printed in small font on a small piece of paper. I would encourage them to move to an 8 1/2 by 11 sheet and enlarge the font and illustrations of the icons. The intructionsheet displayed the icons nicely, but did not address them in the sequence they appear on the display. I always think it is more understandable if they are presented in the order you see them on the display. I also found the icons to be quite logical in comparison to some we have seen on other pets. That makes the pet a lot easier to operate. The Rough Rider's instruction sheet was printed in red ink on white paper and I found that combination a bit difficult to read. Especially with the small fonts. The Sumo Fighter instructions were in dark green ink on white paper and I could read them easier. I found the reset button a little confusing. It has a very very small print decal by it. I had to use a magnifying glass to read it. It said, "Before playing, remove the battery isolation strip and press the reset button using a pointed object." The decal is placed over one of the "sunken/ recessed" case screw holes and the word "isolation" is suspended over the hole and hard to read. Once you have the game going, if you neglect it for a few days and return, the screen just says "Champ" and your pet is gone. To restart from this mode, I assumed I needed to press the reset button, but instead, you have to press the two outside buttons simultaneously (this is spelled out in the instructions). Once the game is going, the reset button can be used to get rid of your current fighter and begin training a new one. Initially I was unable to do this (restart an existing pet). I tried it with a folded paper clip and I guess I just did not get it pressed hard enough. Later on I was able to restart with a folded paper clip. After a fight, you pet displays "Winner" or "Loser" on its display. The instructions do not explain how to get from that display back to regular play. I found that pressing the round button on the left will return you to regular play. You first start the pets by removing the isolation strip and pressing the reset button. The reset button is on the back and is recessed down a small hole. Normal ink pens will not reach it. I had to use a paper clip. When the pet starts, an animated display followed by 4 photos is displayed along with some music. You are then given an opportunity to name your fighter, set the clock, and turn the sound off or on. Some music is played (if you leave the sound on) and the game is up and going. I liked the case (rectangular and flat on the sides) which allowed you to sit the pet down in an upright position (leave it standing upright). The nice large easy to distinguish buttons, and the large display were nice features of the basic design. Additionally, I found the "icons" to be the largest, easiest to see, and most understandable of any pet we have tested. The pets emitted a "beep" when you moved to the next icon which helped you determine exactly what you were selecting. The buttons had a nice "feel" to them. All these features made them convenient pets to operate. The pets have a nice heavy duty chain with a large "snap" which will encourage boys to hook them to their belt loops. The snap looks very nice, but I found them a bit difficult to operate. They want to "twist" in your hand when you try to open them. When you select the Health Meter it begins by displaying the same animated display and 4 photos displayed when the pet started. This takes a few seconds and I found it very annoying. You want to check on your pets health and make adjustments, not see this same display over and over. I found that if you hit the far right "Confirm" button again, you can blast on through the display and get to the statistics on your pet. This is not pointed out in the instructions. The Health Meter displays your pets name, age, weight, discipline, happiness, hunger, and power. After your pet reaches 18 it also displays Life, Wins, and Losses. It could be a little plainer about which meter is which characteristic. The instructions present them in two rows and I could not figure out exactly which order they were being presented in for a while. The actual presentation order with the selection buttons is: Name, Age and Weight, Discipline Index, Hunger Index, Happiness Index, and the Power Index. I found the Discipline Index, Hunger Index, and Happiness Index icons a bit confusing. When you start the pet it is 16 years old and weighs 100 pounds. The pets cannot fight until they are 18. They age a year a day, so it takes two days of care and training to prepare your pet to fight. I found the "Life" statistic a bit strange. When you pet reaches age 18 and the statistic begins, you have 10 lives. As you begin to fight the pets, the won and loss record is displayed in the Wins and Losses statistics. For each win you add a Life (only if you had less than 10 lives, you cannot obtain more than 10 lives) and for each loss, you lose a life. I assume that if you eventually get down to zero lives that the pet dies? Nothing about that in the instructions. When we first saw the press release, we were not sure if you can link more than two of the pets together or not. The packaging and instructions show that you can. You just keep linking as many as you wish together and have fighting tournament. You just press the "confirm" buttons on the pet furthest to the left and also on the pet furthest to the right and the winner will begin fighting the next fighter in the row until there is only 1 fighter left. When the pets fight, you have no interaction with them, you cannot select any fighting technique or control any weapons. You involvement is only in the care and training of your fighter. I think the pets would be more interesting if the user had some level of control of his fighter during the fight. Some pets have a very poor timekeeping. These pets kept good time for several days of testing. When your pet is sick (which seemed hard for me to determine) the pet needs Medicine. You must give it medicine twice. Once now and one more time at least 10 minutes later. I started the pets one morning and the next morning they seemed to want to sleep all day. It was about 5pm by the time I figured out they were sick and needed medicine. Upon getting the second dose they jumped right up and were ready for all kinds of activities. I think others might have also been confused what do with them when they stayed in bed. I really liked the weight lifting and knocking down the brick walls as training exercises. The pets turned 18 about 9:30 am on the second day of operation. I immediately began trying to fight them. First I tried sticking the cases together (which I had already tried earlier and had not exactly figured out how to do it) The cases have two male ports on the left side and two female ports on the right side. If you just push them together, they do not seem really connected or linked together. I found you have to press them fairly hard together and then the cases "snap" together. Once they are securely "snapped" together, you see the word "FIGHT" displayed. Pulling them apart also takes more force than I would have assumed. An 8 year old might have trouble snapping them together the first time, until they understand it takes that much force. When you fight the pets, they each dance around in their display and throw punches and "things" toward the other pet. When one begins to win, he goes over into the other pets display and trounces him. Then one pet display says "Winner" and the other says "Loser". I found the winner was still in pretty good condition from his health meter, but the loser always ended up sick in bed. He had to be given medicine (once now and once 10 minutes later). The loser's strength was also reduced. He required only a couple weight lifting and brick training sessions and he was ready to go again. A max downtime of about 15 minutes. This might be a bit long for a school recess (only fight once in 15 minutes unless you win), but many schools do not allow the pets anyway. My two pets made distinctively different sounds. The Sumo fighter made much "deeper and lower" sounds than the Rough Rider. I liked the Sumo sounds better. Most of the evaluation of these pets (and the Talking Nano Puppy) was done over a Christmas trip my wife and I took to go back and visit with our families. I showed the pets to several people and many found them interesting. My mother was not very pleased that the pets fought. She thought their should be other linking activities instead of fighting. Both she and my father seemed more entranced by the Talking Nano. They became excited when it began to talk and my mother thought its case was "pretty". In general the pets did not require much attention and were far less demanding than the typical puppy, kitten type virtual pets. I think they would provide a lot less disruption in schools than the earlier pets. The units use two of the normal button batteries, the same size as the other keychain pets. Three small screw hold the battery cover in place. When we tried to remove the batteries, I found they used a spiral spring to "engage" the batteries. Most units us a bent flat blade of metal to act as a spring to force the batteries to make good contact. This spiral spring, was somehow caught on one of the battery cases and it was not very difficult to get off, it was just a little puzzling at first because I could not see what was going on. You can see the small spiral springs sticking up from the battery compartment in the photo below. The basic rectangular case (not including the male and female ports which slightly extend from the sides is about 1.65 inches wide by 2.16 inches high. The case is about .67 inches thick. The "cut out" for the display is about .885 inches wide by .845 inches tall. The display itself has icons at both the top and bottom of the screen. This makes the active area of the display quite rectangular (much wider than it is tall). I logged the before and after fighting statistics for some fights to show how the game operates and selects a winner and what kind of "readings" you might expect. When I linked the fighters together, I put the red Rough Rider fighter on the right and expected him to win since he had a little more "power" (he was at 164 and the Sumo fighter was at 160). However, the Rough Rider was a little lower on some of the other readings and he lost the fight. This tends to indicate the winner is not purely selected by "power level". After the fight, Rough Rider immediately showed up sick in bed. I gave him medicine, and he went back to his sick bed. I waited the required 10 minutes to give him his second round of medicine and then he jumped up and was ready to go again. At that point in time his power level had dropped from 44 (after the fight) all the way down to 16. I then took him through 2 weight training sessions and one brick training session and his power level returned to 164. I observed this routine in later fights as well. The winner maintains his power level. The loser loses a great deal of his power and ends up sick in bed. You give him one round of medicine, wait 10 minutes and give him another and he is up and ready to train.. Three training sessions will build his power up into the 160 range and they are ready to fight again. I followed the same rehab procedure I did after the first fight, except this time it was the Sumo Fighter that needed the attention. Two doses of medicine 10 minutes apart (his power had dropped to 16), followed by 3 training sessions) and the Sumo Fighter was ready to go again. I noticed that in all 3 fights, Happiness seems unaffected by winning and losing. If I were fighting, I would be happy when I won and sad when I lost. I do not understand why they did not incorporate that into the "program". First we want to point out, we offer Virtual Pet Design Services that can review prototype pets or concepts of pets and supply information like this page and these improvement suggestions that can be considered before the designs are finalized. This allows the manufacturers to bring even better pets to market. We thought the Nano Fighters were great pets. There are several suggestions here, but the bar of expectations has been raised much higher than it was in the past. Users are expecting a lot more out of their pets. We think that if some of the ideas below were incorporated in the Nano Fighter pets, they would be even better pets. Point out on the packaging that the instructions are inside the folded display card the units are packaged on (many people throw them away because they do not know they are in there). Print the instructions in a larger font and on a larger piece of paper. In the instructions, describe the functions (icons) in the same order they appear on the pet's display. Do not use red ink on white paper for the intructions (difficult to read). Make the "reset" decal easier to read. Make the reset button more accessible (hole is so small that an ink pen will not reach it). Find a "snap" for the keychain that is a little easier to operate (doesn't twist in your hand when trying to open it). Some boys might like to move the initial pets age to 17 (from 16) so they only have to train it one day and then they can begin to fight it? Get rid of the display shown to you when you select the Health Meter. The several photos of the pet were very annoying. We just want to check on the pet's condition, not see a commercial. Make it more plain which index is being displayed by the health meter. Discipline, Hunger, and Happiness were hard to decide which was which. Explain the "Life" statistic. I am still not sure of its purpose. Does the pet really die when it gets to zero? It seems to just be another way of tracking wins and losses but it has a "max value" of ten. Do a better job of helping the user determine if his fighter is sick or not. After the first night's sleep, both of my pets were sick and I was most of the day wondering why they did not "wake up" and get out of bed. The health meter does not actually have a "Health Index". Improve the "feel" of the way the cases "snap" together. Mine took a lot of force top join and separate. Have the happiness of the fighter go down when they lose a fight. Add "some level of control" of your fighter during the fight. This would make it a lot more interesting. I really liked the pets. The shape and feel of them was excellent. They were easy to use and not a big burden to take care of. The graphics of the fighters walking around, flexing and lifting were "cool". I have since seen the fighters in Wal-mart at a lower price point, and think they will become a very popular linking pet.